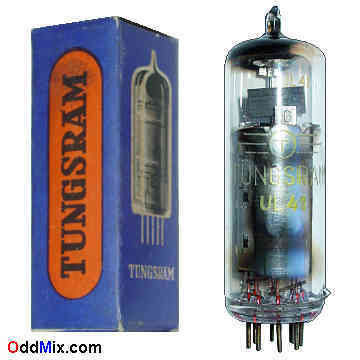 This is a genuine, vintage, Hungarian made Tungsram UL41 power pentode type electron tube. Good subtitutes - except for heater voltage - are the EL41, 45A5 types. Developed for an output stage for AC/DC, universal receivers as a class A amplifier. A power amplifier pentode can be used for many other circuits like oscillators, transmitters and sound Hi-Fi amplifiers. Excellent for amplifiers, antique radio restoration, radio amateur projects or to set up a private vacuum tube museum. This tube is in excellent working condition.